Location: Situated on W corner of Church Street and Bush Street. Church is interesting as the first ecclesiologically correct church in SW Wales, unusually based on local Pembrokeshire models (Tenby and Castlemartin). Plans were made 1845, David Griffiths and John Jones were builders, F Waples clerk-of-works. Cost was ú3,912. Tower is described as too low in 1848, and in 1857 Harrison said that it was not completed as planned, as a Royal Engineer from Dockyard supervised works. 1846-8 Anglican Parish Church designed by James Park Harrison. Grey squared limestone with slate roofs, C13 style based on Pembrokeshire examples. Triple gabled nave, aisles, chancel, SE chapel and NE vestry, tower between N aisle and vestry. Coped gables and cross finials. Chancel has 3 lancets to centre of E end, 2-light with trefoil each side, single S side light, small pointed door and 2-light. S aisle has (from E): two single lights, one 2-light, door in gabled stone porch and single light. W end has three gables, two lancets and roundel to centre, single lancet each aisle. Nave N side has 1878 gabled stone porch and 3 lancets. Tower is sheer with NW stair tower, corbelled flat parapets and lancet bell-openings. 1865 iron clock faces. Pointed stair door and lancet over. Vestry single light and door beyond. Plastered walls, steep-pitched open roofs, pointed grey stone chamfered arches to 5-bay arcades, chancel arch, and chancel side arches. 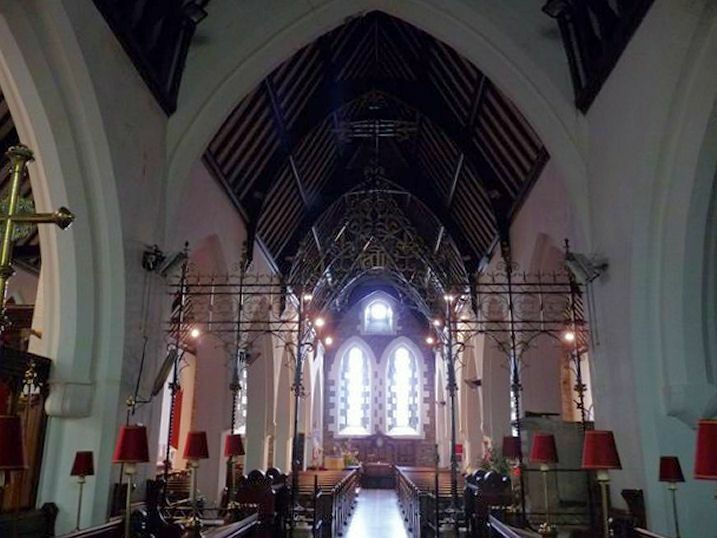 Chancel has open rafter roof, sedilia on S side and fittings of 1878 by Wilson, Willcox and Wilson of Bath, who added ornate iron screen on low carved stone base, Gothic stalls and desks and E wall encaustic tile panelling. E window with rich colours 1898, by Herbert Davis. SE chapel was refitted 1919-20 by J Coates Carter as War Memorial, with oak screens to S aisle and chancel, sanctuary panelling, carved oak reredos and glass by C E Kempe and Co in E window and 2-light S window. Further series of windows by Kempe and Co in N and S aisles, mostly c1919-20, but one 2-light with C E Kempe emblem (pre-1907), otherwise three S aisle single lights and two single lights in N aisle. Very ornate Bath stone pulpit on short shafts and massive plain octagonal font of the 1878 refitting. Situated at NE corner of churchyard, at W corner of Bush and Church Streets. In walled garden to south of the Parish Church. Situated at NE corner of Church Street, E of Parish Church. One of a pair of houses midway up stepped terraced row on W side.